KUALA LUMPUR, Malaysia — Manny Pacquiao won by knockout for the first time in nine years to claim the World Boxing Association welterweight title, and made a proclamation. "This is it. 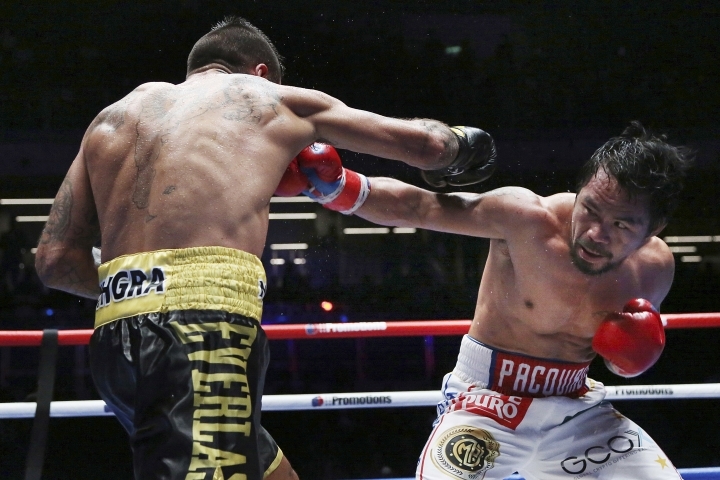 I am back in boxing," the 39-year-old Pacquiao said after his seventh-round knockout of Lucas Matthysse on Sunday. "I am not done. I'm still there." It was Pacquiao's first bout since a contentious loss last year to Jeff Horn in Australia, and since parting ways with longtime trainer Freddie Roach to work with Buboy Fernandez. "It's just a matter of time. You have to rest and get it back and that's what I did." 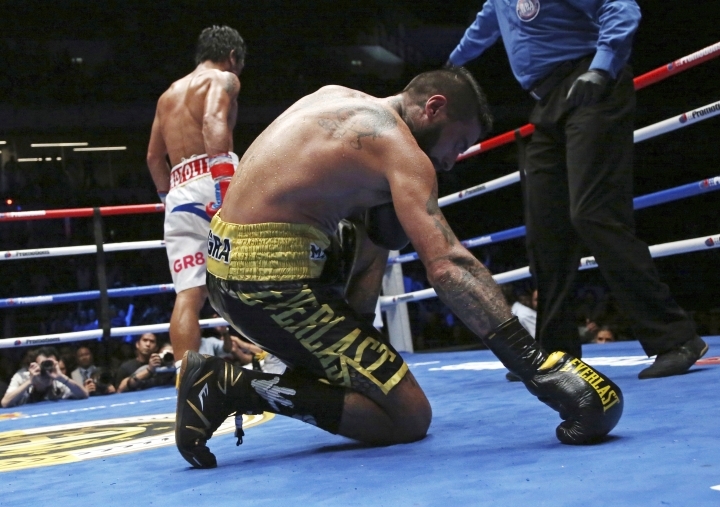 Pacquiao (60-7-2, 39 KOs) knocked Matthysse down onto one knee in the third and fifth rounds. He knocked the Argentine down again in the seventh, and Matthysse spat out his mouthpiece, causing a frenzy among Pacquiao fans in the stadium. "I am not boasting but ... 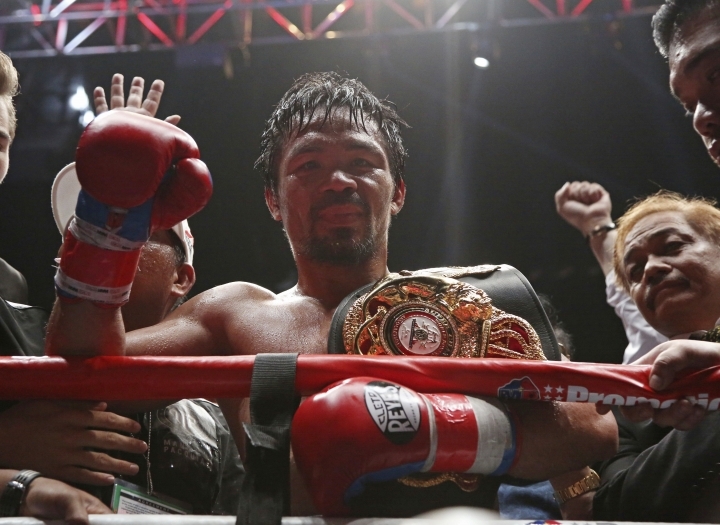 I think he's hurting from my punches," said Pacquiao, who hadn't won by knockout since 2009. "Every punch that I throw, he's hurt. I think he's scared of my punches." Matthysse, who won 36 out of 39 matches by knockout, said Pacquiao was a "great fighter, a great legend," adding that he planned to take a break. Philippines President Rodrigo Duterte and Malaysian Prime Minister Mahathir Mohamad attended the fight, the biggest in the country since the 1975 heavyweight clash between Muhammad Ali and Australian Joe Bugner. "I would like to congratulate Senator Manny Pacquiao for giving us pride and bringing the Filipino nation together once more," said Duterte, who flew to Malaysia for the bout ahead of an official visit. 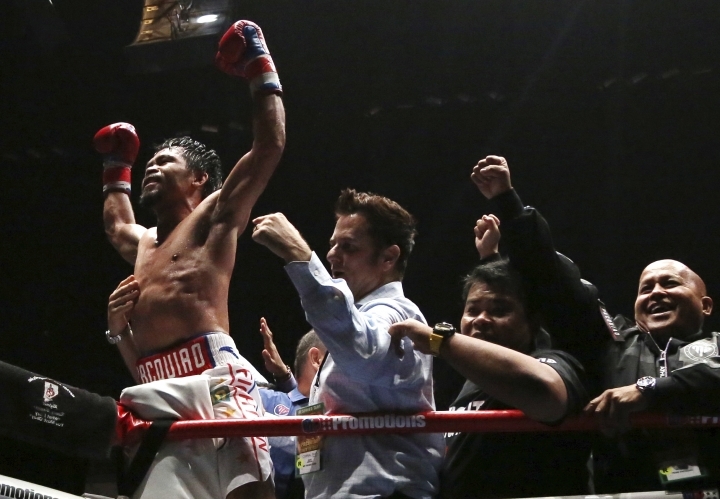 Duterte said in a statement that Pacquiao has proven himself again as "one of the greatest boxers of all time" and that the win will cement his legacy in the sport. 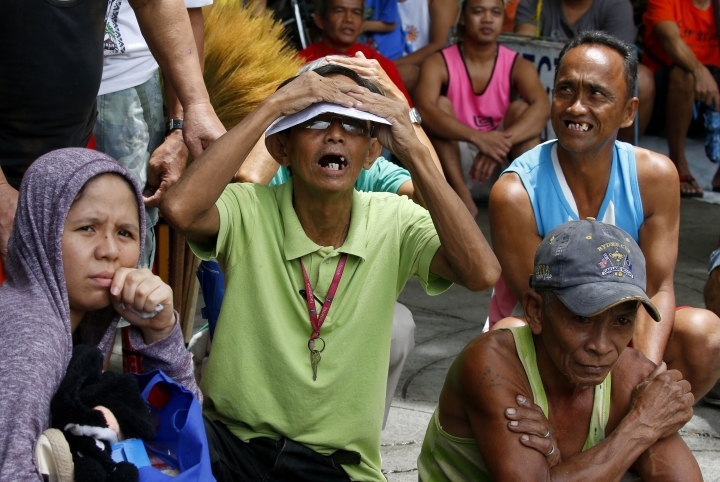 Scores of screaming Filipino fans in the stadium waved flags and chanted "Manny, Manny" throughout the match. Pacquiao's rise to fame from an impoverished rural childhood to become one of the world's wealthiest sportsmen over his 23-year career has made him a national hero. Pacquaio said he will return to his work as a senator for now but won't be hanging up the gloves just yet. "I am addicted to boxing. I really love to fight and bring honor to my country," he said. "That's my heart's desire." Horn, who lost his WBO welterweight title to Terence Crawford in Las Vegas last month, was quick to respond to Pacquiao's victory. "Congratulations Manny Pacquiao," Horn posted on Instagram. "Rematch?" In the other title fights, Filipino Jhack Tepora had a knockout win over Edivaldo Oretga of Mexico for the interim WBA featherweight title. Venezuela's Carlos Canizales defended his WBA world light flyweight title against China's Lu Bin, who had been aiming to become the first boxer to win a major world title in just two career fights. South African Moruti Mthalane got a unanimous decision against Pakistan's Muhammad Waseem to capture the IBF flyweight title.